Instyle LED Lighting: DMX wall controller or Wireless remote control? DMX wall controller or Wireless remote control? There are many control options when it comes to controlling the RGB LED tape. Selecting which controller you require comes down to what type of application you have installed the LED tape in and how much control you are looking for. There are various controllers; from wireless remote controls right the way through to programmable PC based controllers. Here is a little information on each controller type and the advantages and disadvantages of each one to help you choose which control option is right for you. This controller is a wireless remote control. RF stands for Radio frequency, this meaning the controller does not need to be ‘line of sight’ with the receiver to work. The handheld controller can work the receiver (controlling the LED’s) up to 20m away. The receiver can also pick up the signal behind objects etc. This making the product great as you can install the receiver behind false walls, cupboards etc. It is always advised to have access to the receivers and transformers in the unlikely event of a fault. The Instyle LED wireless controller is a touch remote meaning it has touch screen rather than buttons – this has great advantages in the fact it has a ‘colour wheel’ allowing you to touch to select any shade of any colour. Other options include full dimming, white, on/off and colour scrolls. The controller can control both 12v or 24v RGB LED tape and both the standard 7.2w RGB LED tape or the high power 14.4w RGB LED tape. The Instyle LED wireless controller is commercial grade using premium components and is ideal for homes, bars, restaurants and small clubs. 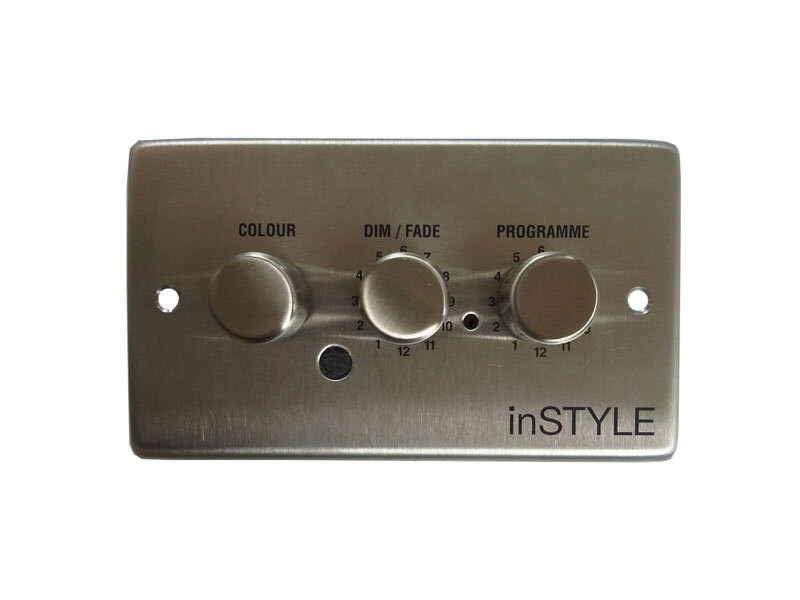 Instyle LED’s wall controller is a 3 knob, double gang wall controller that comes with a stainless steel finish. The wall controller works to control DMX receivers which control the RGB LED tape. The main advantage of DMX control is the fact you can link as many DMX receivers together and they can all be controlled off one controller. This meaning there is no limit to how much RGB LED tape you can control compared to the 50m limit of the wireless controller. This makes this controller ideal for larger venues, clubs and bars. The DMX wall controller comes complete with its own plug in power supply (hard wired version also available on request) this plug in power supply has 2 RJ45 sockets and with CAT5 cable links to the wall controller, meaning you can mount the wall controller wherever required and simply connect a CAT5 cable back to the power supply. The 2nd RJ45 socket is then for connecting CAT5 cable to the DMX receiver that also has 2 RJ45 sockets which you can connect one to the next in a daisy chain method. 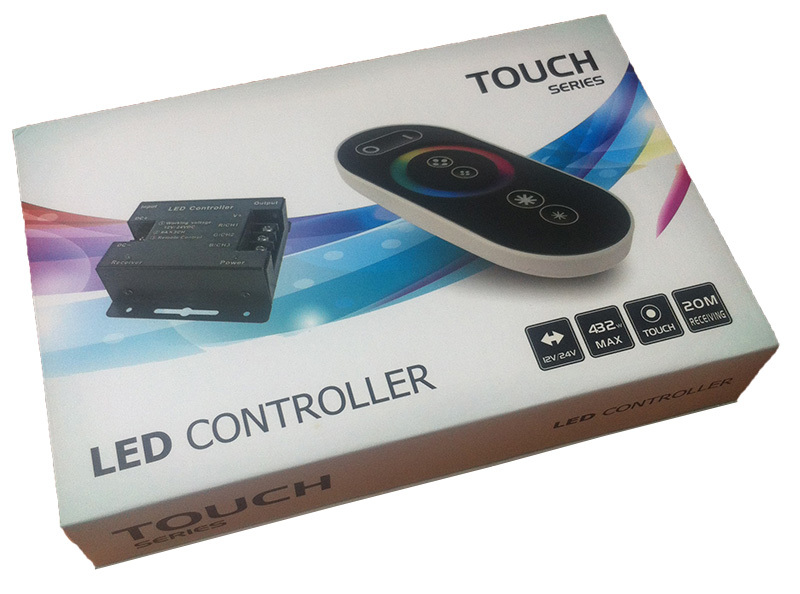 The wall controller gives you complete control over the RGB LED tape and because it is hardwired the control is instant. The wall controller has 3 rotary knobs – the left knob selects any shade of any colour. The middle knob is full dimming. The right knob is pre-set programmes from time delays through to white shades to ‘sound to light’ mode. There are other control options out there on the market, for example a wireless remote control IR type – this is a wireless remote control with an infra-red receiver we choose not to the supply this product as they cannot usually control more than a small amount of LED tape, they also require the remote to be line of site with the receiver when controlling, this meaning you cannot hide the receiver behind false walls or cupboards etc. 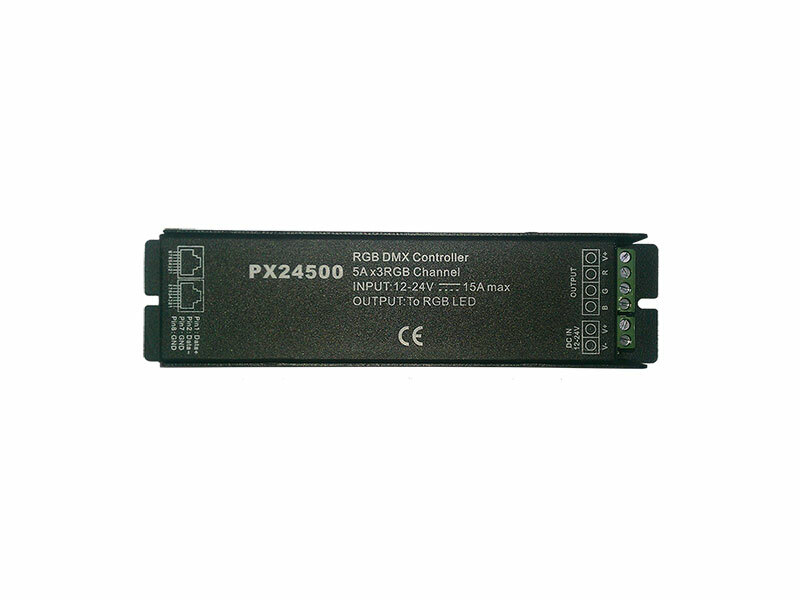 We also supply just the RGB DMX receivers to allow customer to use their own DMX head unit (controller). Customers sometimes have large DMX systems with other products and have a PC based controller that they would want to use to control our RGB LED tape. AS our receivers are standard DMX 512 this can be done.